The 2018 Las Vegas Jeep Club Sand Drags & Hill Climbs is in the books after a great weekend of racing at the Dumont Dunes. Dave Stidham took victories in the top two classes as he bested Grant Fraysier in the finals of Pro Boost & Pro Drag. Dave also recorded he quickest pass of the weekend with a 3.45. Justin Adamson was the big winner on the day overall with 4 class wins and 2 runner-ups. Including a win in the Pro Gambler 2 (4.25 Index) category. Justin also earned the Best Engineered award for having the vehicle that did the most winning over both the Sand Drags & Hill Climbs events. Another big winner on the day was Stephen Chase, who piloted his UTV to both the Pro 3 (4.60 Index) and UTV Unlimited class titles. Another top runner on the day was David Costa, who won the Pro 1 (3.80 Index) class along with scoring two runner-up finishes. KC Springer piloted “Ben’s Revenge” to the Pro Gambler 1 (3.95 Index) victory while his ride also earned the Best Appearing award. Other winners on the day included Grant Fraysier (XX600 Truck), Jack Weddle (Pro 4), Wendy Thompson (Women’s - Pro 2), Maricela DelaRosa (Women’s Pro 4 & Women’s UTV Stock), Aurelia Gilmore (Women’s - Duner) and Eric Young (Juniors). We have tons of video & photos to be posted over the coming days. National Sand Drag News is proud to announce that Good Vibrations Motorsports will be back on board as the Presenting Sponsor of the NSDN Live Stream in 2018. Good Vibrations Motorsports has upped their commitment for this season as they will be on board for a total of five events, ensuring Live coverage from all Southern California Sand Drag Association (SCSDA) and Avenal Sand Drags races this season. NSDN Live Stream trackside segments can be accessed through our Facebook Page at https://www.facebook.com/NationalSandDragNews/ on all event weekends; be sure to like our FB Page & turn “On” notifications to be alerted each time we go Live. Good Vibrations Motorsports can be found at www.GoodVibesRacing.com, where you can view their full selection of high performance mail order items specializing in Supercharged & Mechanical Fuel Injection applications. NSDN Live Stream Presented By Good Vibrations Motorsports race dates will be: February 23-25 (SCSDA), March 23-25 (SCSDA), April 20-22 (Avenal), September 28-30 (SCSDA) and October 26-28 (Avenal). The great folks at Avenal Sand Drags & the Southern California Sand Drag Association along with Race Director Chachy Zavala have teamed up to put on the 2018 California Sand Drag Challenge Points Series Presented By DBKO Design + Build AND Central Cal Windows. The California Sand Drag Challenge will contest of the three SCSDA events held at the Soboba Casino in San Jacinto, CA as well as the two events held at Avenal Sand Drags in Avenal, CA for a total of five events on the 2018 schedule. All five races will count towards championships. NSDN will have coverage from all five events and will host the current points standings for the series. For full details, click “Read More” to check out the document below. The 20th Annual Heartland Nationals at Atoka Motorsports Park in Atoka, Oklahoma will be taking place on Memorial Day Weekend May 25-27. This year’s event features a Guaranteed $5000 Purse for the Top Alcohol & Top Eliminator categories. There are also Bracket & Index classes for all types of Race Cars & ATV’s. Check out the recently released Info sheet below with a listing of all classes as well as the event schedule. For more info on this great event, contact John at 580-775-8511, Derek at 580-239-0457 or Debbie at 580-239-0889. Also, check out Atoka’s web site at www.AtokaSandDrags.com for their full 2018 Race Schedule. Click “Read More” to view full Event Info & Flyer. The So Cal Sand Drag Association (SCSDA) is preparing for their 2018 Season Opener coming up on February 23-25 at the Soboba Casino in San Jacinto, CA. Event info links are listed below. There are also a few changes for the 2018 SCSDA Season that are listed below the links. For more info on the SCSDA, go to www.SoCalSandDrags.com. 1. Racer Registration Fees have been lowered across the board. 2. Everyone entering the facility will purchase Parking/Camping & Weekend Arm Bands. Once you are in the gates, park your rig and then head to Registration. 3. Registration will now be next to the front gate by TECH. 4. There is now a $20 Safety Surcharge per racer (not entry), only exception will be for the Junior racers. 5. 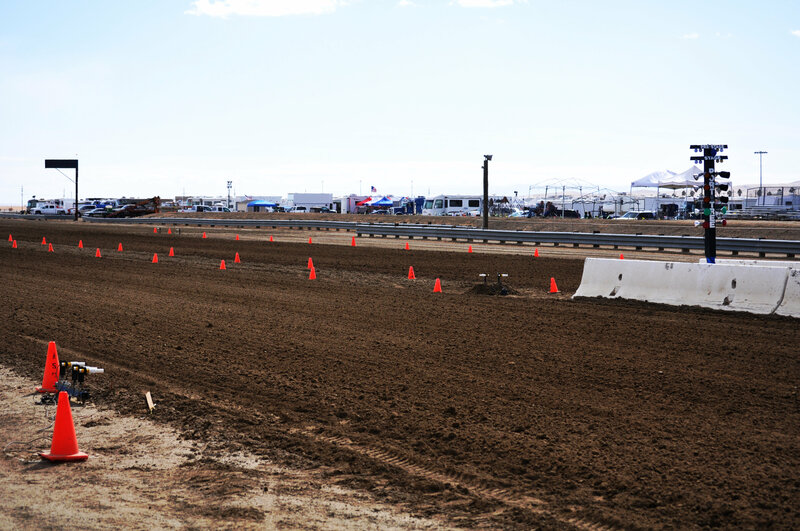 The SCSDA & Avenal Sand Drags, Inc. will run a 5 race points series. A Gold Card will be awarded to all class champions and will be valid for both tracks covering Racer Registration fee. (This does not include arm bands & parking) Full details on the series will be released shortly. 6. The 3.95 Index class has been added to all SCSDA events and will be contested in the points series. 7. Both the SCSDA & ASDI will run under the same rulebook in 2018. This will be posted soon. Avenal Sand Drags in Avenal, CA has announced their 2018 schedule. The 2018 Avenal Sand Drags race dates will be April 20-22 (Spring Nationals) and October 26-28 (Fall Nationals). Further info will be forthcoming regarding event details & race day schedules. For more info on Avenal Sand Drags, go to www.AvenalSandDrags.com. 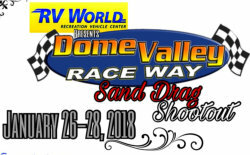 Dome Valley Raceway in Wellton, AZ will be holding the DVRW Sand Drag Shootout January 26-28. The Top Fuel teams of Marcus Norris & Dennis Rieck are planning on competing at this event. For more info on this event, go to the Dome Valley Raceway Facebook Page or call Ernesto at 928-503-9675. Click “Read More” to view full event flyer.